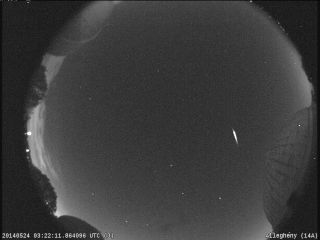 A brilliant meteor as bright as Jupiter streaks across the sky in this NASA all-sky camera view of the Camelopardalid meteor shower of early May 24, 2014. The meteor shower was created by dust from Comet 209P/LINEAR. A new meteor shower sparked some celestial fireworks late Friday and early Saturday (May 23-24), amazing stargazers across North America even though it did not reach the spectacular "meteor storm" levels that some had hoped for. A small Camelopardalid meteor streaks through the northern lights as the Milky Way shines overhead in this stunning photo by stargazer Gail Lamm from Balmoral, Manitoba in Canada on May 24, 2014. "Although this is a far cry from predictions, it is hardly a surprise," Philips wrote in a Spaceweather.com update. "The parent comet, 209P/LINEAR, is faint and currently produces only a small amount of dust. Most forecasters acknowledged that there might be less dust in Earth's path than the models suggested." Phillips also suggested a tantalizing theory. "Another possibility is that the shower is not a dud, just delayed," Phillips wrote. "If models mis-located the debris zone, an outburst could still occur later on May 24th." The Camelopardalid meteor shower gets its name from the constellation it appears to radiate from — Camelopardalis (The Giraffe) — and was primarily visible from North America. It is made of dust leftover from the relatively dim Comet 209P/LINEAR, which was discovered in 2004 and orbits the sun once every five years. Stargazer Gail Lamm captured a stunning meteor photo while watching the Camelopardalids from just a few miles north of Balmoral, Manitoba in Canada. "I went out looking for the meteors last night, didn't see too many, but I did manage to get a picture with a bit of the northern lights, the Milky Way and a small meteor," Lamm told Space.com in an email, adding that the meteor appeared low on the horizon. Photographer BG Boyd captured this photo of a meteor from the Camelopardalid meteor shower over Tucson, Arizona early on May 24, 2014. The meteor display was created by dust from Comet 209P/LINEAR. In Tucson, Arizona, photographer BG Boyd also spent hours watching the meteor display. His photo shows a bright meteor streaking over a dark Arizona landscape. "I saw about 10 [meteors] for the two hours I was out, and this was the biggest and brightest," Boyd told Space.com in an email. "Also, the Milky Way can be seen in the right part of the photo." The website Slooh.com, which runs the online Slooh community observatory, captured stunning a video animation of Comet 209P/LINEAR using a remotely operated telescope in the Canary Islands. The comet's dusty tail is clearly visible in the Slooh animations, Slooh president Patrick Paolucci told Space.com via email. Several other observation campaigns tracked the Camelopardalid meteor shower late Friday night and early Sunday. The Italy-based Virtual Telescope Project featured a rotating view of photos by astrophotographers, while NASA's Marshall Space Flight Center streamed live views from an all-sky camera. A team of astronomers led by meteor scientist Peter Jenniskens of the SETI Institute in Calfornia aimed to observe the meteor shower from above the clouds by flying at 20,000 feet aboard a specially chartered jet. NASA meteor expert Bill Cooke, head of the Meteoroid Environment Office at the Marshall center in Huntsville, Alabama, said his team captured a stunning video of a Camelopardalid meteor as bright as Jupiter during the night. By studying the number of meteors from the Camelopardalid shower, astronomers can learn how active Comet 209P/LINEAR was 200 years ago, Cooke said. The dust emanated from comet two centuries ago is what created the meteors seen early Saturday, he added. Editor's Note: If you caught an amazing photo of the new meteor shower, or any other night sky view, that you'd like to share for a possible story or image gallery, please contact managing editor Tariq Malik at spacephotos@space.com. Email Tariq Malik at tmalik@space.com or follow him @tariqjmalik and Google+. Original article on Space.com.